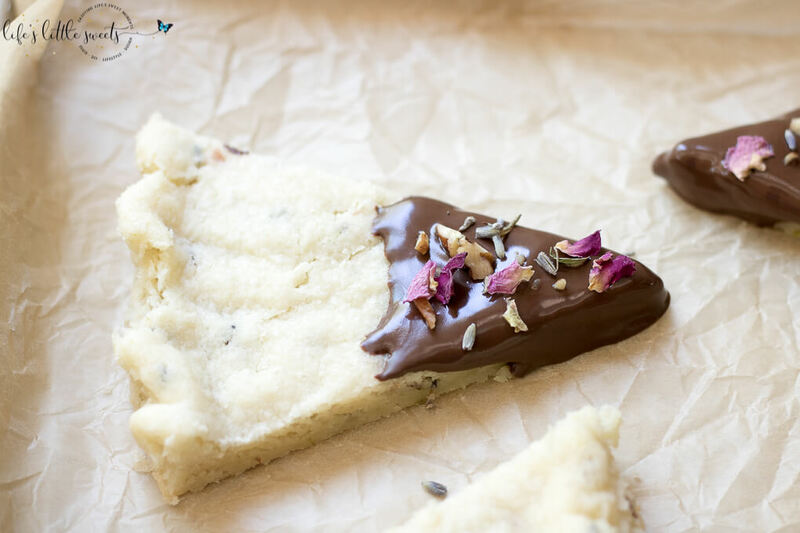 Lavender Rose Shortbread Recipe: This post originally appeared on the bMAKER blog as Lavender Rose Shortbread. 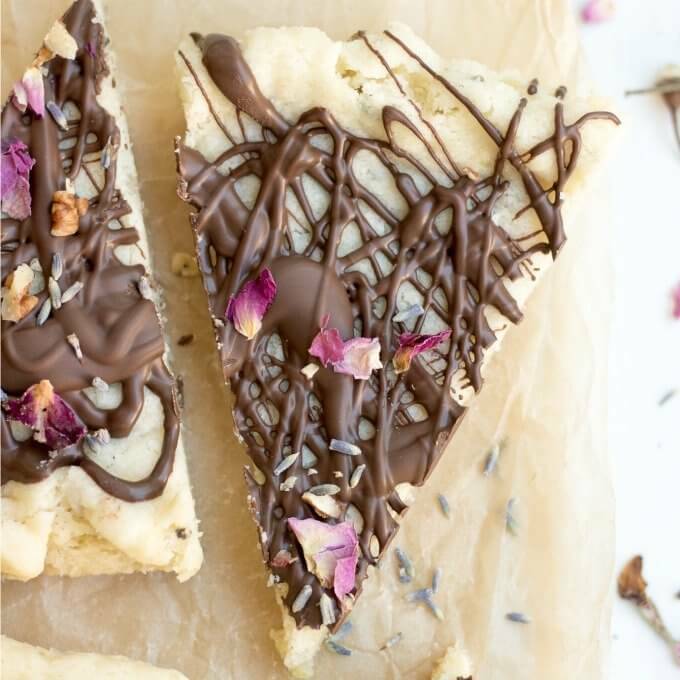 This Lavender Rose Shortbread recipe is a herb-infused, classic shortbread cookie, dipped in dark chocolate and decorated with dried lavender and rose petals. 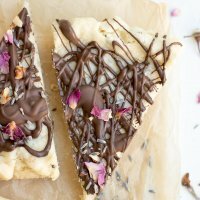 Hi Everyone, may I present this lovely Lavender Rose Shortbread. 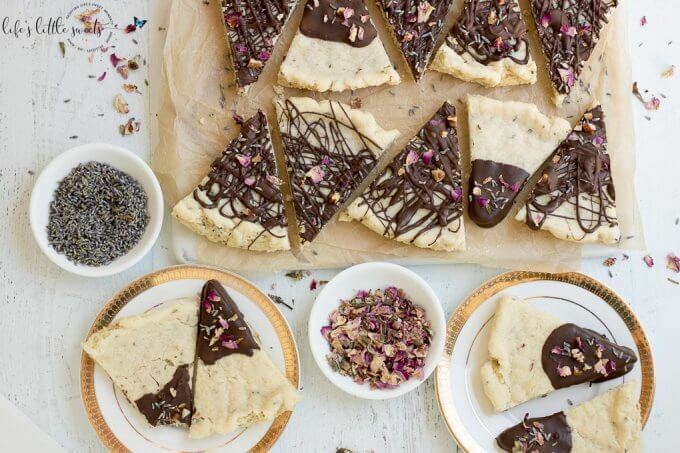 It is a classic shortbread recipe that is herb-infused with dried lavender and rose petals, then dipped in dark chocolate and adorned with chopped pecans and more lavender and rose petals. 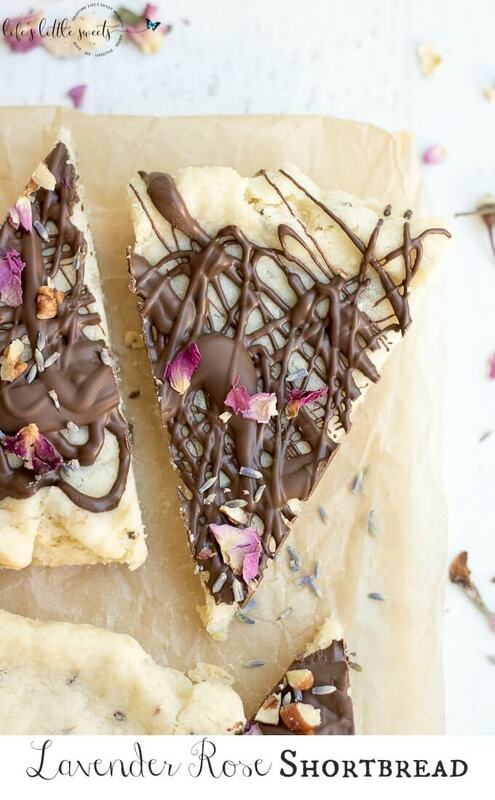 This Lavender Rose Shortbread would be perfect with tea or coffee, making it a pretty and sweet addition to any brunch table. I can also see them as a treat to bring as a dessert to a gathering or even for a special birthday party. 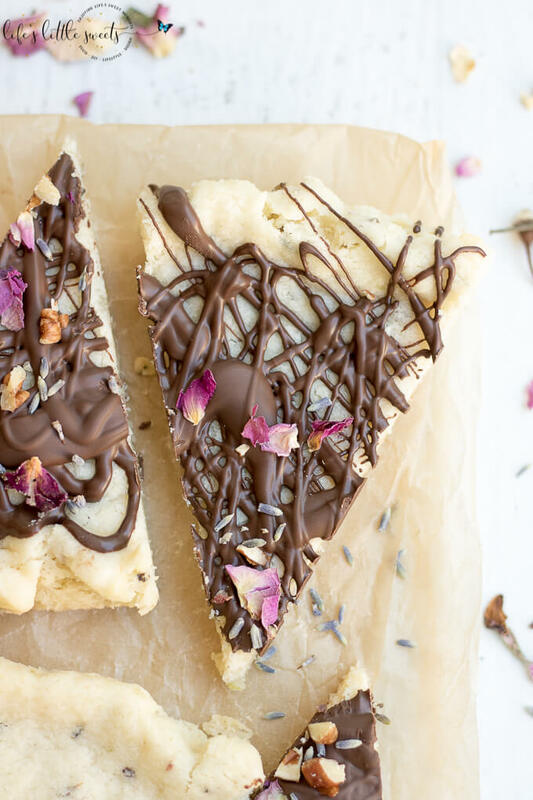 The rose petals are so subtle but they are the perfect pairing to lavender and there’s a secret ingredient that adds a freshness: lime zest. 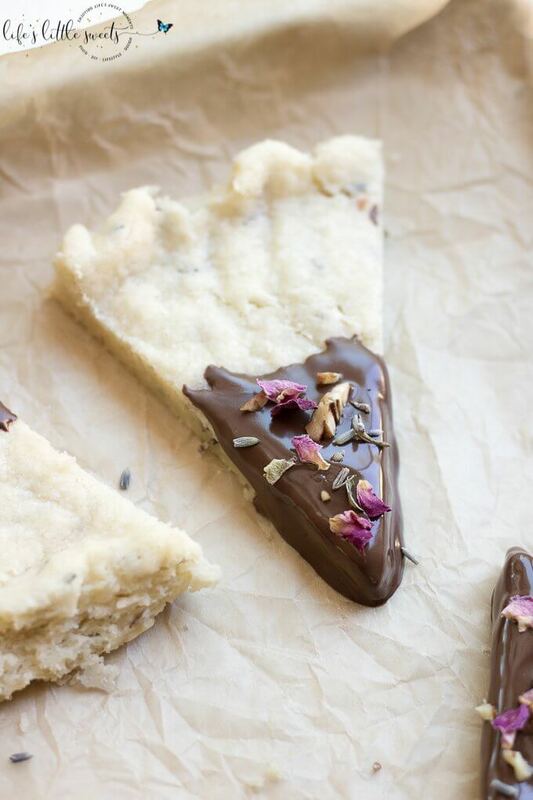 The inspiration for this Lavender Rose Shortbread recipe came from my Lavender Shortbread recipe. 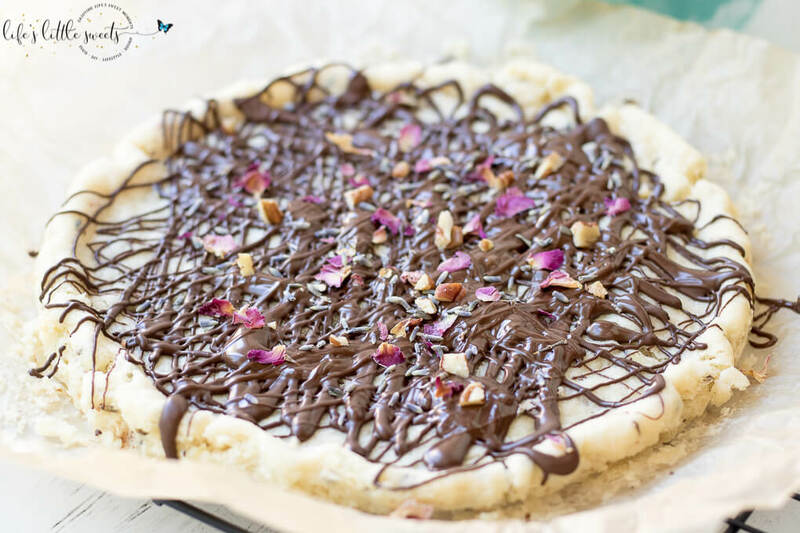 With this recipe I am showing a different way to cut the shortbread, like a “pie slice” making it look more like a tart and you can add the chocolate as a drizzle which I feel holds the shortbread together very well, especially if you are going for larger pieces. 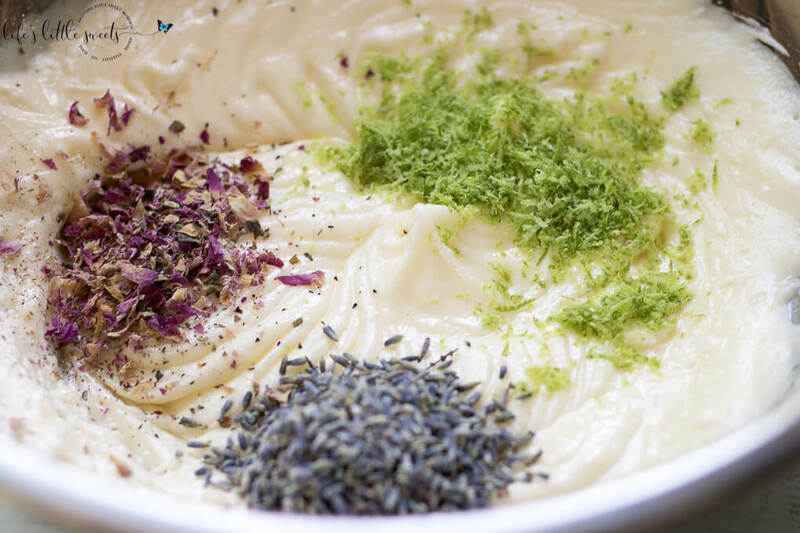 The difference is the type of zest and the use of dried lavender instead of fresh. This way you can make a delicious version of this recipe year round! 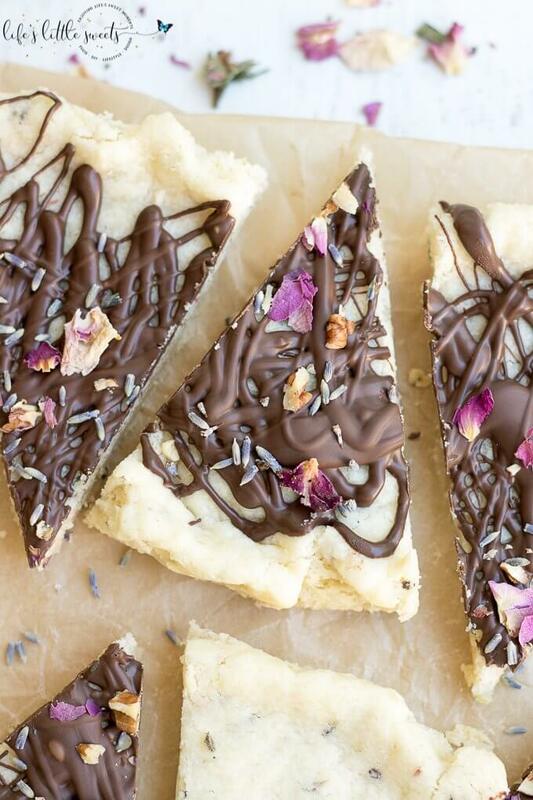 I know you will love this oh-so-pretty, Lavender Rose Shortbread recipe, if you make it, let me know the occasion you are making it for in the comments below! Grease 2 (9 inch) round cake pans (or line with parchment paper) set aside. In a large mixing bowl, cream together, the unsalted butter, granulated white sugar and confectioner's sugar. The mixture should be light and fluffy. 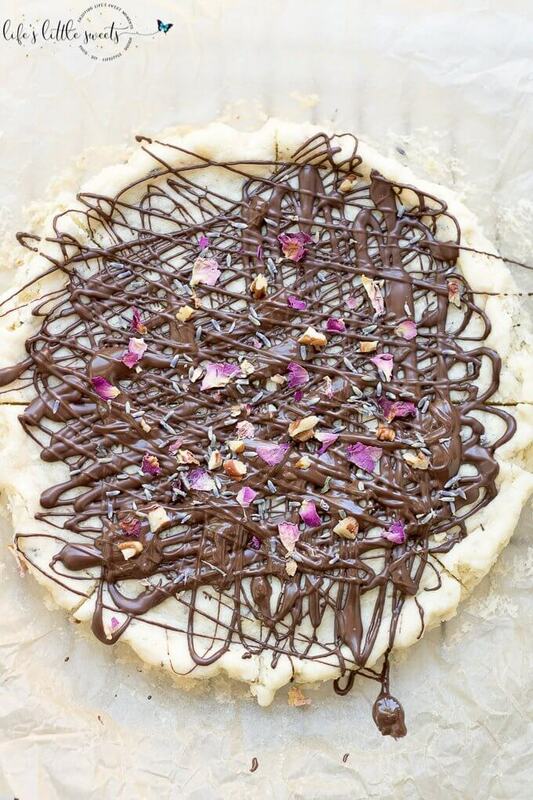 Add in the dried lavender, rose petals and lime zest. 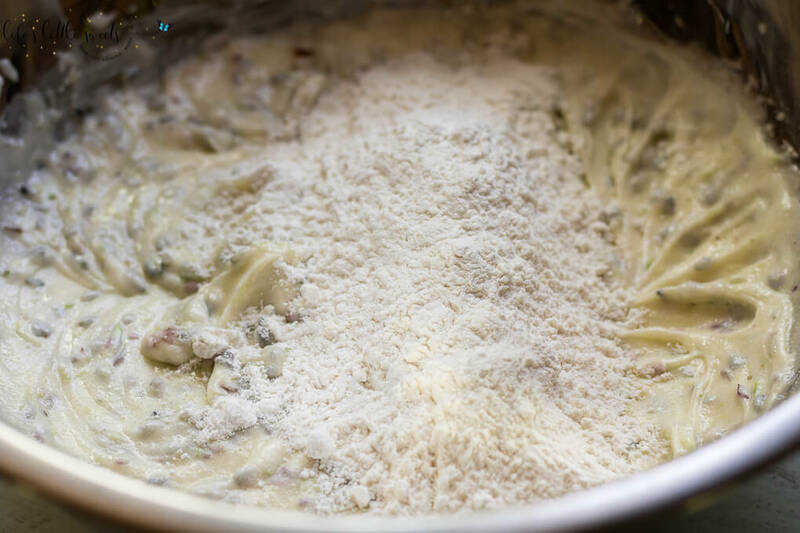 In a medium mixing bowl, combine the all-purpose flour, cornstarch and kosher salt. Gradually, add into the butter mixture until combined. 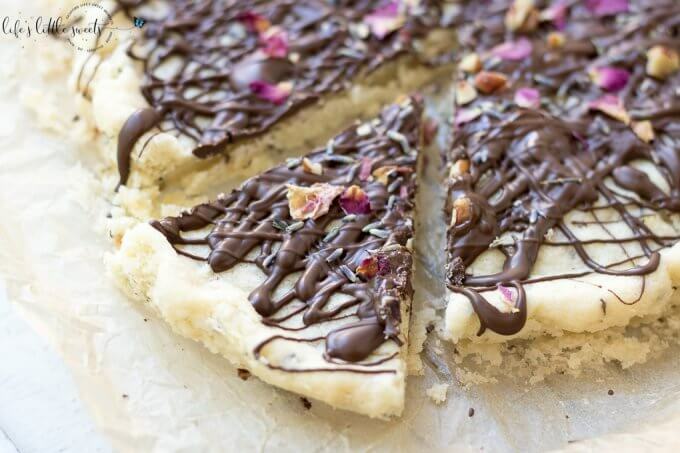 Divide the dough into 2. 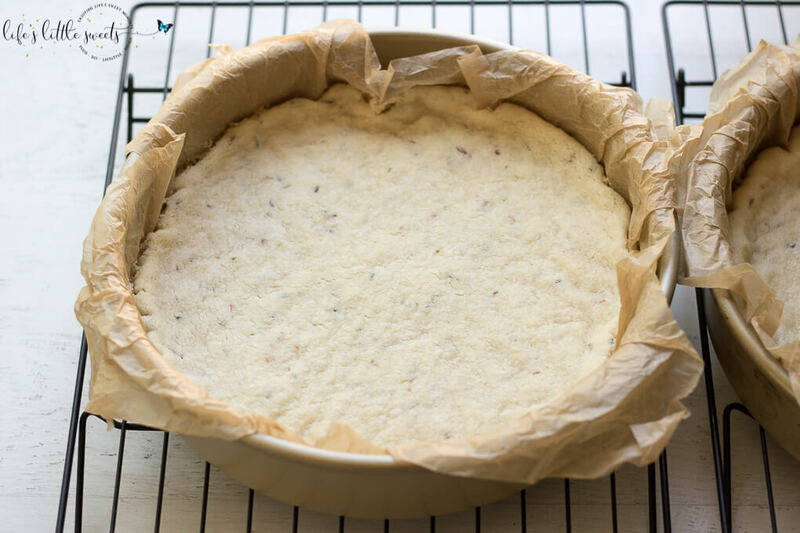 Press first dough into the first prepared cake pan evenly. Repeat with 2nd cake pan. 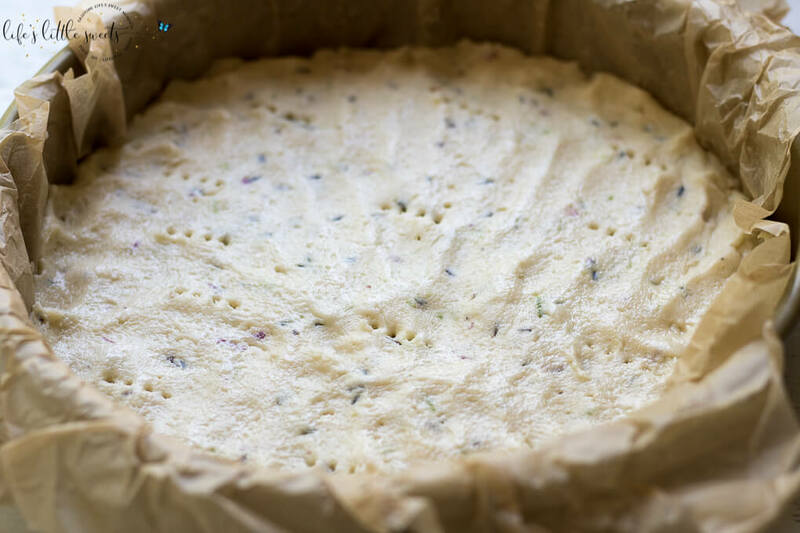 Using a fork, prick the pressed dough to prevent bubbling up when baking. 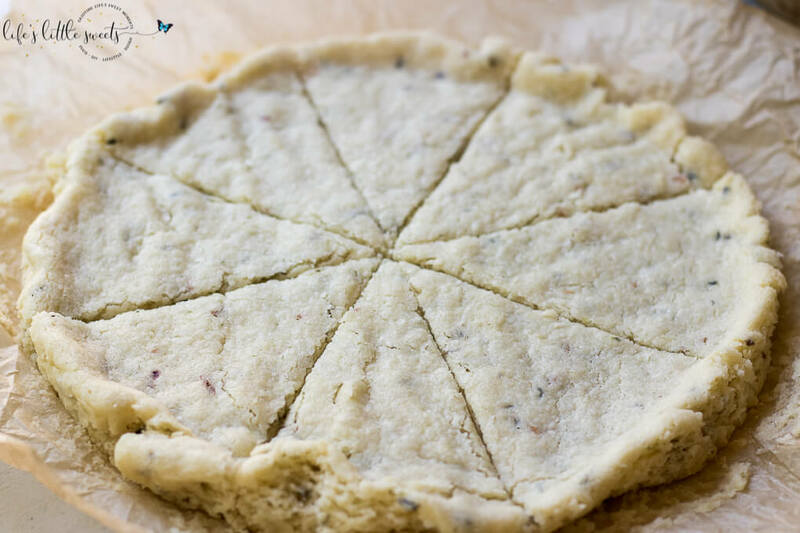 Bake for 18-20 minutes in the preheated oven, until edges are slightly golden; the shortbread should still be white. Cool on wire racks for 5-10 minutes before slicing and removing from the pan. 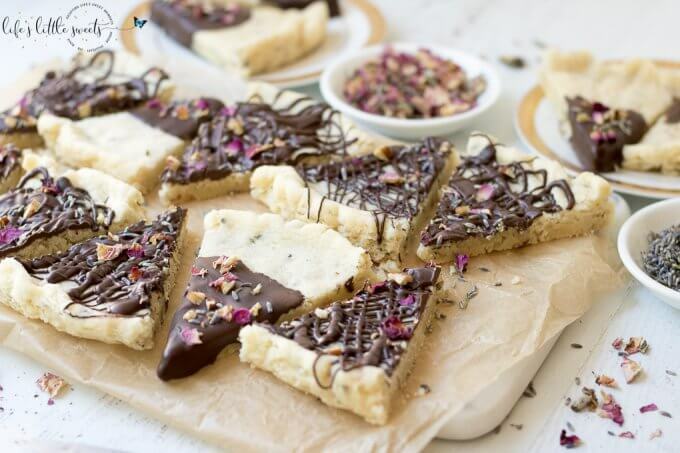 After 5-10 minutes, slice and place shortbread on the wire racks to cool completely. 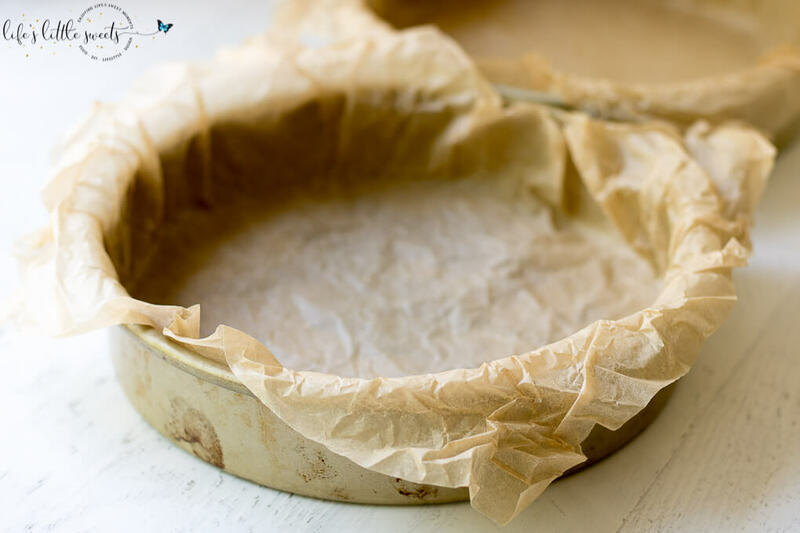 If you lined the cake pans with parchment, you can just easily lift the shortbread from the pan before slicing. Line a 2 rimmed baking sheets with wax or parchment paper, set aside. To keep it from sliding around, you can crinkle it up and then spread it in the baking sheet; it will stay put better this way. 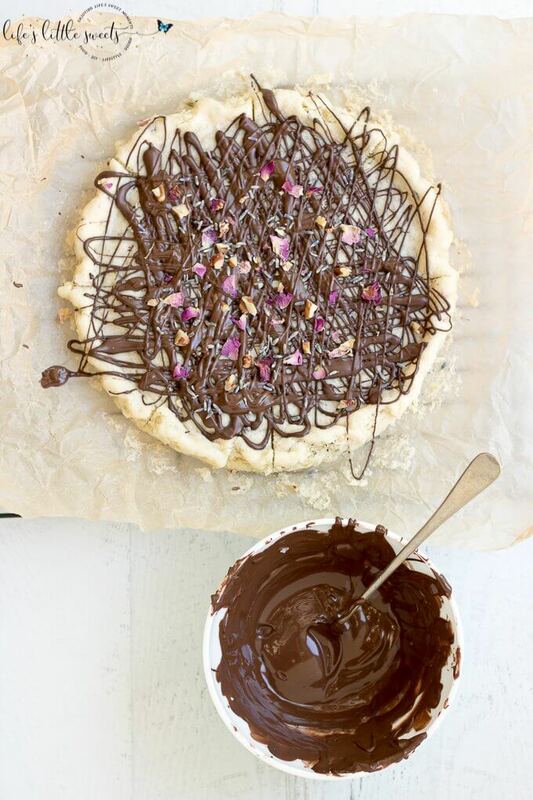 Dip the completely cooled shortbread into the melted chocolate and place on the prepared baking sheet. 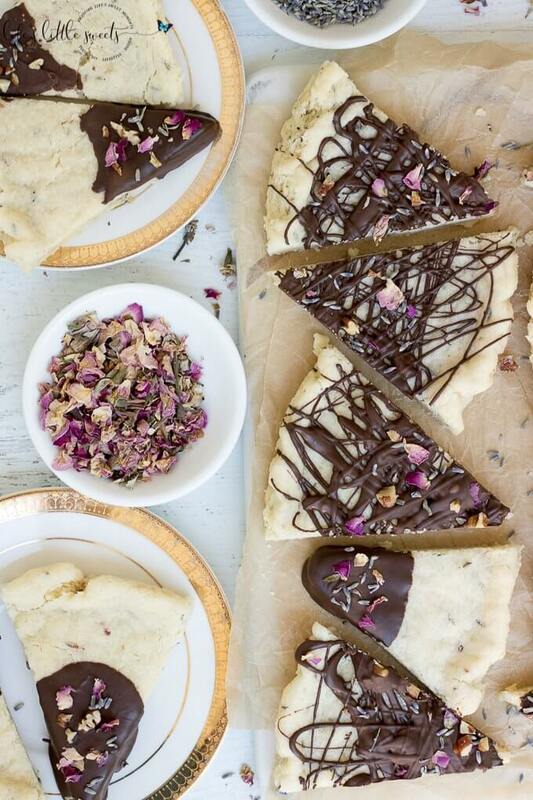 Sprinkle with dried lavender, rose petals and chopped pecans. 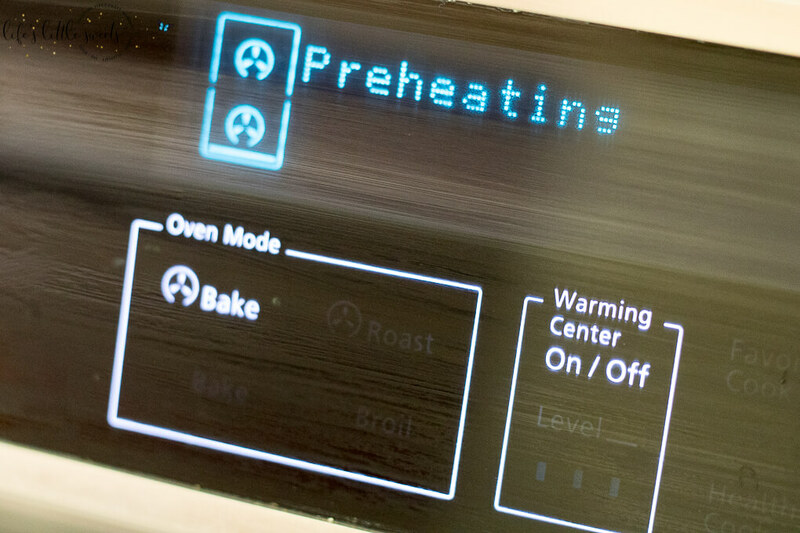 Place in the freezer for 10-15 minutes to set quickly. 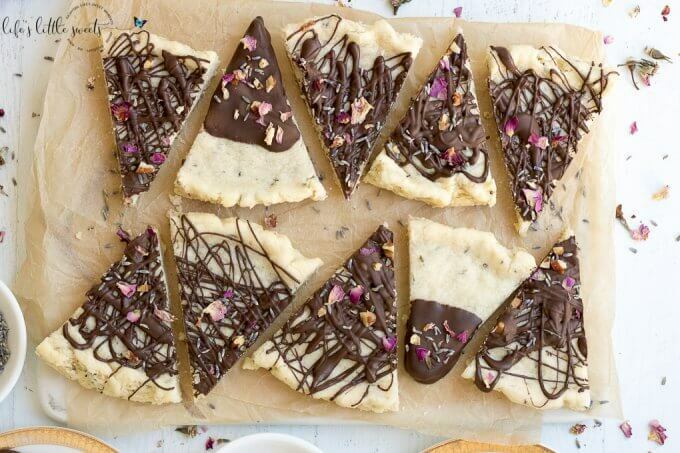 Alternately you can drizzle the melted chocolate over the shortbread before slicing and decorate with the dried lavender, rose petals and chopped pecans before it hardens. Place in the freezer for 10-15 minutes to set quickly. Serve and Enjoy! Looks so delicious! Such a great idea for an activity with kids on vacation too. YUM!